Some vacation spots are exceptional choices for families with kids of all ages – even hard to please teens. St. Thomas is a favorite family travel spot, as there’s so much to see and do. The U.S. Virgin Islands are known for their watersports, the beaches are spectacular, and Charlotte Amalie provides a wide choice of diversions for avid shoppers. It’s impossible to get bored. Convenient ferries also make island hopping to St. John and Tortola an easy proposition. While St. Thomas is a good choice for family trips, selecting the right resort is key. The Wyndham Sugar Bay Resort & Spa is loaded with family pleasing amenities including a pool area with waterfalls, a white sand beach, a well-equipped spa, tennis courts, miniature golf, and bumper boats. In addition, this is one of the few resorts in the U.S. Virgin Islands that offers families an all-inclusive vacation option. Location is an important factor in choosing a resort. 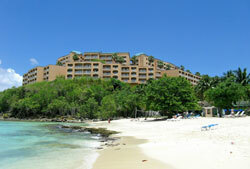 For those who love natural beauty, the Wyndham Sugar Bay Resort & Spa is a superb vacation choice. Set on the eastern end of St. Thomas, the resort is conveniently located near some of the island’s most spectacular beaches. Magens Bay, often named as one of the ten most beautiful beaches in the world, is twenty minutes away. Coki Beach, home to Coral World and its resident attractions, is also nearby. In addition, St. John, with its bevy of world-class beaches including beautiful Trunk Bay, can be easily reached via ferries leaving hourly from nearby Red Hook. Comfortable Rooms and Facilities. Set on 31 landscaped acres overlooking Atlantic Ocean, the Wyndham Sugar Bay Resort & Spa was named as one of the Caribbean’s “Best All-Inclusive Resorts” by Caribbean Travel & Life magazine. The resort’s 294 rooms include 74 connecting rooms as well as 25 “Clean Air” PURE rooms and one suite, designed specifically for guests who suffer from allergies. These rooms have been put through a Pure-Process that reduces potential irritants and also feature Wyndham’s Signature “Be Well” bedding. Since high levels of moisture in the Caribbean can be problematic, these rooms are a great choice for families who want the highest air quality possible in their guest room. PURE rooms are available in both bay view and ocean view categories. We tried one out during our stay and the air quality was excellent. Year-Round Kids Klub and Fun Family Activities. The Wyndham Sugar Bay’s Kids Klub is open throughout the year to entertain children ages 4-12. Half-day (9 a.m. to noon or 1-4 p.m.) and full day sessions are available. The cost of the program is $40 for a half-day session and $95 (including lunch, drinks and a snack) for the full day session. Children must be signed up at least 24 hours in advance with the Pool Concierge. At least one staff person is present for every 6 children participating in the program. Activities include adventure hikes, treasure hunting, board games, crafts, sand sculpting, movies, music and dance, cultural education and more. The program operates with as few as one child, although activities such as cookie and pizza making require a minimum of 6 children. Children are split into separate groups if there is a major disparity in ages to make the program fun for all involved. In addition, babysitting services are also offered through the hotel’s Tour Desk with 24-hours notice. Sitters are available through a third-party provider at the rate of $20 per hour for up to three children. The Wyndham Sugar Bay offers lots of fun family activities in addition to the kids’ program. Favorites include bumper boats, miniature golf, iguana feeding, watersports, tennis courts, beach volleyball, and games around the pool. The resort’s white sand beach provides the perfect place for teens to lounge and excellent snorkeling is located near the shore. In addition, kids and teens enjoy the resort’s extensive array of tours including dolphin programs, sailing trips, snuba and sea trek activities, parasailing, pirate adventures, trips to Coral World, and kayaking. Cool Pools. 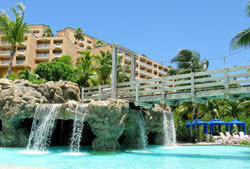 The Wyndham Sugar Bay features an extensive waterpark area with three interconnected pools surrounded by palm trees, waterfalls, and a shaded grotto area. This pool area is one of the highlights of the hotel, as families can easily spend the entire day here. The Mangrove Restaurant and the Iguana Grill serve lunch right near the pool and a wide variety of drinks are available to guests lounging by the water. The beach’s white sands are located just a few steps from the pool. Award-Winning Spa. Families deserve to be pampered and vacations provide the perfect time and place. The Wyndham’s Journeys Spa offers a wide variety of treatments for guests of all ages. Adults can choose from massage therapies, facials, body treatments, spa packages, beauty services, and several specialty treatments. Families will be pleased to know teens and kids ages 12 and under aren’t left out at this resort. There are skin treatments and manicure/pedicure combinations available for them as well. All-Inclusive Option. Both room-only and all-inclusive vacation plans are offered at the Wyndham Sugar Bay Resort. Many readers have indicated that they prefer all-inclusive vacations because they know in advance how much their vacation will cost and can budget accordingly. In addition, parents enjoy the chance to relax on their family vacation knowing that they can try out lots of different things with out constantly having to say “no.” The Wyndham Sugar Bay Resort & Spa is one of only a few resorts in the Virgin Islands that offer the all-inclusive plan and specials are sometimes available. Make sure to check the resort’s website for more information. For more information about the Wyndham Sugar Bay Resort & Spa, visit www.wyndhamsugarbay.com, call 1-877-999-3223, or contact your favorite travel agent. The resort offers a number of excellent deals and specials throughout the year, so make sure to check the website before booking. Join Wyndham Rewards, Wyndham’s frequent guest program. Special discounts and offers are sometimes made available to Wyndham Rewards members and guests booking directly through Wyndham will also receive customized By Request member benefits. Benefits are not available if the booking is not made through Wyndham Resorts. If your family enjoys eating three full meals per day and not having to worry about the cost of drinks and smoothies, consider purchasing the resort’s all-inclusive plan. The plan includes meals, drinks, and all non-motorized water sports. Items from the Café located on the second floor above the lobby are not included. If you’re looking for the resort’s resident iguanas, check in the trees by the bridge leading to the pool and by the little lake near the fitness trail. You’ll see lots of them there. The resort also holds iguana feeding sessions – check for current times. Don’t miss dinner at Caribe – it’s fantastic. We went there twice and the Latin-Caribbean fusion cuisine was superb. Caribe is the smallest of the resort’s restaurants with only 44 seats, so plan to get there early. Taxis are readily available at the resort and per person transportation fees are charged. A local transportation stop is located at the entrance to the resort, providing transportation to Charlotte Amalie and other parts of the island for $2 per person. It’s important to note, however, that some of the vehicles and drivers may be unlicensed. Ask for more information at the resort. No passports are required to enter the U.S. Virgin Islands, but you may want to bring them along anyway. The British Virgin Islands are tantalizingly close, and the Wyndham offers a variety of tempting excursions to take you there, including day sails to Jost van Dyke and dolphin encounters in Tortola. Passports or raised seal birth certificates along with government issued photo IDs are needed for entry. If you’re thinking about visiting Magens Bay, be aware that there’s a $4 per person entrance fee. Concessions, bathrooms, and picnic areas are available. Lounge chairs are available for $7 per day (plus a $7 deposit) and beach chairs are available for $5 (plus a $5 deposit). Ferry service to St. John is available from Red Hook, about a five-minute drive from the resort. Current schedules are available at the hotel’s tour desk and at (Virgin Islands website). Plan to leave the resort at least 20 minutes prior to the ferry’s departure to allow time to purchase ferry tickets and get a good seat. Make sure to arrive at the St. Thomas airport at least 2 hours prior to departure. Although the island is part of the United States, all passengers must clear customs prior to leaving St. Thomas and the lines can be quite long. If shopping in Charlotte Amalie is important, plan your visit for a day when a cruise ship is in port for the widest selection of shopping venues. In the off season, a number of stores close when cruisers are not in town. Alternatively, if you’re planning to visit St. John, try to plan your trip to Trunk Bay for a time when cruise ships are not calling at St. Thomas.